The rain from yesterday is gone and we are all enjoying the slightly cooler weather. Recently our Ft. Lauderdale fishing trips were experiencing record heat for two days and we are happy for the relief from the rain as well as the heat. Several species offshore right now. Scattered debris on current edges in roughly 800 feet of water right out front of our inlet (Port Everglades) have been holding some Mahi-Mahi. Skipjack Tunas out there as well. Near shore the Kingfish have slowed a bit but are still available. Bonito basically are gone for now. Wahoo continue to be a possible catch mostly just off the reefs. 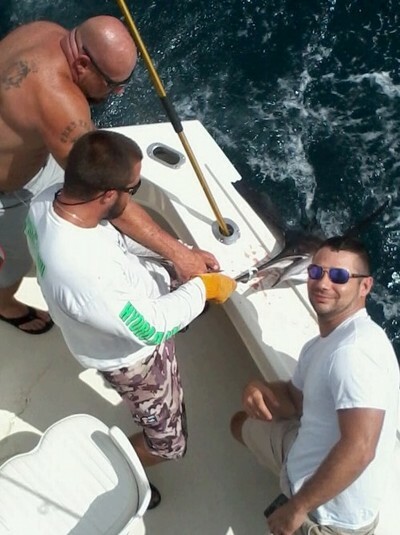 There are occasional Sailfish available as shown in this photo of catch and boat side release for Matt. Good sized adult fish. Swordfish are biting reasonably well and this is a good time of year to go, weather permitting. Calm seas as a result of the early morning offshore winds and continuing comfortable and calm throughout the day as the winds swing to light onshore. Saw our first schools of adult Mullet just off the beach outside the surf line yesterday and then again this morning. One school was calm and relaxed making their way south, the second was being worried by mid sized Tarpon and small Bluefish.